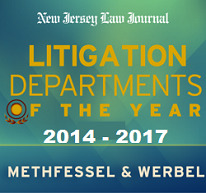 The law firm of Methfessel & Werbel was established in 1972 for the purpose of providing service to the insurance and managed risk industry. We specialize solely in the defense of liability claims, the investigation and defense of first party insurance claims and the prosecution of subrogation claims on behalf of insurance carriers, third-party administrators, and self-insured entities. Our main offices are located in Edison, New Jersey, providing convenient access to courts throughout the state. We also serve our clients with offices in New York City and Philadelphia. We opened our New York and Pennsylvania offices at the urging of several clients who expressed a need for our innovative and aggressive approach to the economical handling and disposition of claims in the New York and Eastern Pennsylvania areas. Our offices have expanded rapidly as we meet the need for high value legal services in the New Jersey, New York and Pennsylvania markets. Our mission is to work as an extension of our clients to expeditiously achieve the most economically favorable resolution of claims on their behalf and on behalf of their insureds. We believe that as your business partner it is our responsibility to create solutions to the legal problems and issues which your organization faces in a timely manner and to deliver those solutions at an unmatched level of value. We pride ourselves on being the most technologically advanced insurance defense and subrogation firm in the industry. We strongly believe in the ability of technology to enhance the claims handling process and to reduce and control costs. We communicate electronically with the majority of our clients and regularly provide our clients with data reports to assist them in the claims management process. Our electronic transmission system is easy to use, universally accepted and designed to integrate easily into our clients’ workflow without requiring any additional investment by our clients. We have also enhanced our computer-assisted legal research capabilities to permit access to more than 100,000 volumes. We are dedicated to providing the most cost effective services in the industry. While most of our defense fees are accounted for on an hourly basis, we encourage the use of creative fee agreements incorporating fixed fees, reverse contingency agreements, volume discounts, and other means of compensation. Subrogation matters are billed on a contingency basis.